So we can all agree that the Contemporary is/was pretty awesome, right? From the bizzare Mary Blair mural to the strange original Southwest theme to the fact that once upon a time the Contemporary housed a liquor store called The Spirit World with a monorail running over it, the Contemporary exerts a fascinating tidal pull of history, aesthetics, and the taste of an era gone by. As hard as Disney may try to update the place or shellac layer upon layer of changes or "improvements" upon the basic original, history haunts the Contemporary hotel like a ghost, always present, peeking out from behind the dayglo neon or turquoise-blue carpet, a stowaway from out of time. But we're all guilty of a grave oversight in overlooking an area of prime Contemporary Resort awesomeness, in fact perhaps the least changed of all the resort's haunted halls and strange passages. We've all rushed past it on our way to the Grand Canyon Concourse - the cheerfully badly named Level of the Americas, or: that place where you have to go from one escalator to another on the way to your Chef Mickey's reservation. Buddy Greco performs tonite at the Top of the World Supper Club. This was serious business, once. Today the Level of the Americas mostly houses a reception area for the California Grill restaurant which supplanted the original Top of the World supper club in 1994. Neo-modern furnishings scatter the handsome wide hallways randomly, sometimes housing guests, slumped in couches like vagrants waiting to be evicted from a train station in a snowstorm. Other times, guests wander aimlessly down those lifeless wide hallways, looking furtively for someone or something that's never there. Since the addition of the new Fantasia-themed convention center wing in the early 1990s designed by Michael Graves, those original Contemporary meeting rooms and banquet spaces seem desolate, remote, and unloved. Very few places in all of Walt Disney World exude the same sense of not belonging as the Level of the Americas. "Is this supposed to be here??" It wasn't always this way. 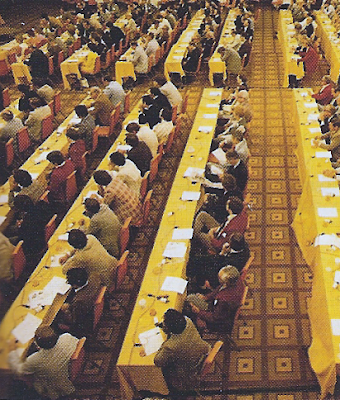 Convention going was a big part of Walt Disney World's bottom line all through the 70's and 80's, and continues to be so today. 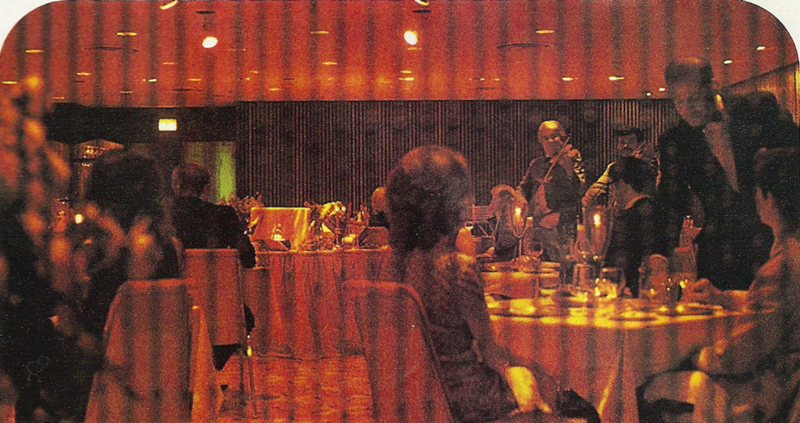 All through the first twenty years of the resort, the absolute top spot for Conventions in all of Walt Disney World was the Contemporary, and the cutting-edge Ballroom of the Americas featured a hydraulic stage which could raise or lower and even closed-circuit television linking one ballroom to another. All drenched in 1970's earth tones, full of hustle and bustle and strange geometric patterns. Because nothing says "here and now" like geometry. "Whoever said work and play don't mix obviously had never enjoyed the paradoxical magic of a Walt Disney World convention or conference. You can conduct successful business meetings and still experience all the excitement, adventure and magic that makes Walt Disney World the vacation kingdom of the world. As you would expect, a Walt Disney World convention makes a marvelous family vacation, too! At the Contemporary Resort Hotel, the headquarters for all major conventions, you will find 30,000 square feet of meeting and banquet rooms and 1,046 spacious rooms. Or, choose from 636 additional rooms at the Polynesian Village Resort Hotel or 151 rooms at the Golf Resort Hotel, all connected by the Walt Disney World transportation system. 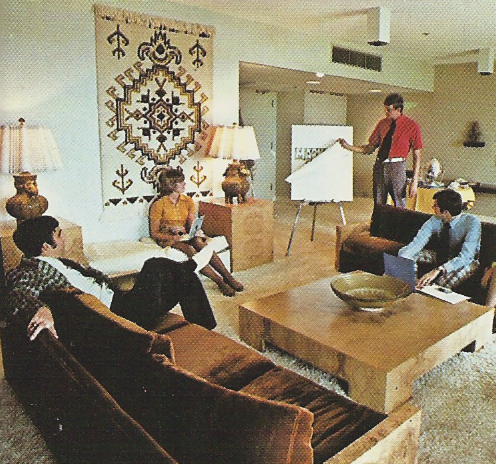 Nearby all the "Convention Excitement", the sedate Gulf Coast Room was largely mysterious. Operating out of the exact same service counter which is now used for the California Grill and built apparently hastily in the adjacent conference room, the Gulf Coast Room was a quick and simple solution for Disney, looking as they were for an extra high end restaurant and which involved nothing more than a few rolls of wallpaper, high backed chairs and linen draped tables. Lighting was dim and simple and there were no windows or even much in the way of decor. The focal-point was on fresh food and continental service. Described in Walt Disney World News April 1976: "second floor. 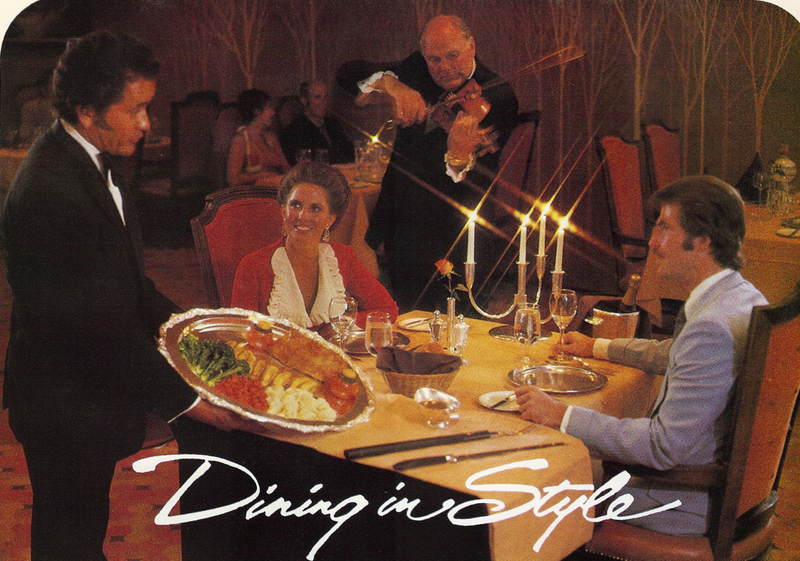 Gracious evening dining, with atmosphere entertainment. Reservations requested, with coats for gentlemen, please. Seatings 6:30 - 10 pm, $7.95 - $12.50." Does anybody even bring an evening coat to Walt Disney World anymore? To put those prices in perspective, $7.95 is equal to almost $30 in 2009, and the highest priced menu item would today fetch almost $46.50. This was not dining for children. 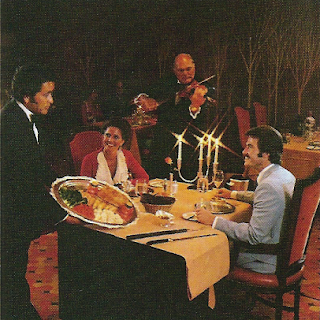 "The elegant Gulf Coast Room, inside Walt Disney World's monolithic Contemporary Resort Hotel, provides the essence of luxurious Old World dining. Here, in a setting aglow with the warm light from dozens of tall tapers, the soft music of a string ensamble fills the air. Each table is serenaded individually with songs of the diner's requests. Dining here can become an evening-long celebration for those who wish to savor the experience. Begin with an apertif, carefully blended for you by a skilled cocktail hostess. To further whet your appetite, follow with an appetizer - cracked Alaskan crab warmed in butter over a chafing dish at the table, or perhaps Oysters Rockefeller*, served in the half shell atop a bed of hot rock salt. After this, you will be in the capable hands of your carefully-trained waiter. If you wish, he will prepare a Caesar Salad for you at the tableside, finally serving the crisp, tasty greens with a chilled fork to make the experience perfect**. Entrees are also prepared at the table - dishes like Pampano en Papillote - a succulent ocean fish stuffed with tiny Gulf of Mexico shrimp, breaded, and then broiled to a juicy golden turn inside an air-tight cooking bag. Many other delicious entrees are also given the final, flaming touches at the table, over flickering braziers***. Many guests enjoy a bottle of fine wine from the Gulf Coast Room's excellent stock. Knowledgeable wine stewards are on hand to suggest the perfect vintage to accompany any dinner. Dessert is often followed by deep mugs of Spanish coffee, again flamed at the table, to bring to an end a perfect evening of dining." * You don't see Oysters Rockefeller much anymore either, but they're basically coated in a rich butter herb sauce spiked with - in the very original recipes - absinthe. **The chilled fork may be excessive, but it's details like this that Disney used to be all about that made the difference. *** There's a word that's ready for a comeback - BRAZIER! All of that awesomeness, packed into a lonely and desolate floor of a hotel that you've rushed past a thousand times. Next time on your way to the new arcade to play an emulated version of Pac-Man, stop by the Level of the Americas and wander around a bit. See if you can guess where those rows and rows of 70's businessmen sat along tables draped in outrageous sunset yellow linens. See if you can guess which inauspicious door the Gulf Coast Room was located behind. Find the lonely grand piano and tucked-away, disused corners and try to imagine what this was like in better days. The Southwestern decor may be gone and the Gulf Coast Room's string quartets played their last note long ago, and the Gulf Coast Room's vertical striped and tree-laced wallpaper may be torn down, but a strange and sad atmosphere still persists, history tucked behind rows of plain beige doors - just another pocket of Walt Disney World fading slowly to black. Before Michael Graves, before Vacation Club, a real view to remember. This post is part of the Disney Blog Carnival. Head over there to see more great Disney-related posts and articles. 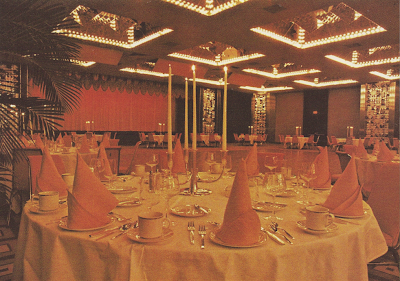 Pictures of the old Contemporary always remind me of the outrageous 70s western decor (so much orange!) in the Overlook Hotel from "The Shining." ^Agreed. The first thing I thought of when I saw these photos was the Overlook. Awesome look back, in any case. I really wish WDW would regain some of the formality it had up until the 90s. Look at some old photos from the theme parks, and you'll see it in the attire. Oh well, at least there is still V&A's for that sort of thing! You had me at Gulf Coast room! Amazing pictures. I miss the 70's yellow and orange all over everything Disney. The Contemporary by far the most fascinating to me. That and the boldly orange and yellow Tomorrowland Terrace. Amazing post. Thank you for your research. By the way, what font is your "Passport to Dreams Old and New" banner?? I remember seeing that all over all kinds of original WDW literature. Thanks! Neo-modern furnishings scatter the handsome wide hallways randomly, sometimes housing guests, slumped in couches like vagrants waiting to be evicted from a train station in a snowstorm. Two of whom are relatives of mine. I have definitely had a nap or two on those couches. Takes me back to my first WDW visit in Nov 1971, which included a stay at the Contemporary. Great post. I wish as well that some formality would come back to WDW. I don't really need Mickey and pals everywhere not even on wallpapers or carpets. Is it just me who thinks that Disney wants to eliminate adults out of their Vacation Kingdom? When you look at 70s brochures the focus is on "Magic" at the theme park and quality elsewhere in the resort. Now it's rather "Magic" everywhere.. Thank you for your posts. They are fantastic! The most infamous moment of the second floor occurred on November 17, 1973. On that day 400 managing editors from the Associated Press gathered in the Ballroom of the Americas to hear a speech from President Richard Nixon. At that time Richard Nixon was deeply embroiled in the Watergate scandal. With accusations mounting against him, President Nixon took the podium and defiantly proclaimed, “People have got to know whether or not their President is a crook. Well, I’m not a crook.” A few months later he would become the first and only president to resign from office. The moment lives on as one of the most famous speeches in history. "Neo-modern furnishings scatter the handsome wide hallways randomly, sometimes housing guests, slumped in couches like vagrants waiting to be evicted from a train station in a snowstorm." This was us. Precisely. On the second-to-last night of our last stay, about two years ago. We had a reservation at the California Grill that we had mistimed, so we had an hour wait, and while so waiting, hit the Disney Wall of Exhaustion, eventually winding splayed out and played out on those coaches, drawing a few blanc stares. We rallied, of course, and finished strong. But I still recall being turned back from the California Grill and reeling, staggering off and finding the empty space. Cool. But it would be much better with current pictures of the space. A long article about a mysteriously empty floor, and not one photo of it being mysteriously empty. Does anybody even bring an evening coat to Walt Disney World anymore? If it's a powder blue coat like that picture, maybe we've evolved a bit over the years. Actually Oysters Rockefeller is something that STILL is quite common in restaurants, and at my grocer's seafood department...at least here in the Pacific Northwest.